Turkish Aerospace updated reporters on the status of Pakistan’s order of 30 T129 ATAK attack helicopters. Currently, Turkish Aerospace is waiting for the release of third-party export permits for Pakistan. The T129 ATAK is powered by two LHTEC (Light Helicopter Turbine Engine Company) CTS800 turboshaft engines. LHTEC is a joint-company of Honeywell in the US and the UK’s Rolls-Royce. Since the engine falls under ITAR, it requires permission from Washington ahead of release. Turkish Aerospace has yet to secure that permit; however, the company is confident that it will receive it. It is unclear if there is an actual ‘hold’ on the license. Granted, US-Turkish relations are not their strongest today, but there are no sanctions on either Turkey or Pakistan to prevent the sale. In fact, this could be a consequence of the unique circumstances of the sale. Turkish Aerospace sought to deliver within months; generally, programs of this nature require years for initial delivery to materialize. 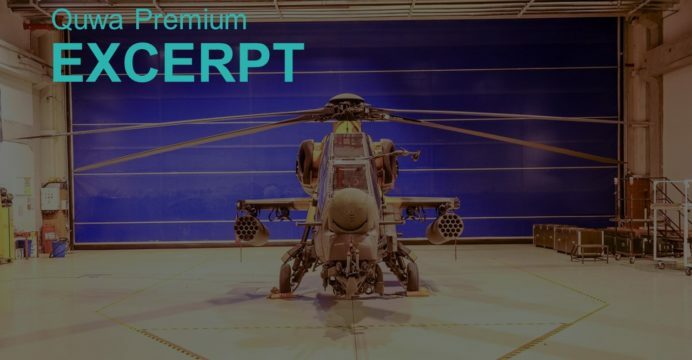 As noted in an earlier Quwa Premium article, it appears that the Pakistani T129 contract is feeding off the same production units intended for the Turkish Armed Forces (TSK). In other words, the first batch for the Pakistan Army Aviation Corps (PAA) would have gone to the TSK instead. Conversely, if the batch is delivered to the PAA, then the TSK’s deliveries will be delayed and the original equipment manufacturer (OEM) will earn an additional sale. This dynamic protects both sides. Turkey does not need to offer Pakistan a loan per se; rather, if Pakistan has the cash, it will get the helicopters. If not, then there is no loss for Turkey in terms of unused or useless inventory – this will go to the TSK as originally intended. In other words, there are no T129-related loans for Pakistan. It is a layaway arrangement that gives foreign customers the option to buy TSK units (at least if they cannot front an advance payment). In its statements to the media, the OEM confirmed this (by stating that the PAA units are from TSK batches). Alan Warnes. “Pakistan’s T129 deliveries ready despite delays.” Shephard Media. 20 November 2018. URL: https://www.shephardmedia.com/news/defence-helicopter/pakistans-t129-deliveries-ready-despite-delays/ (Last Accessed: 24 November 2018). Alan Warnes. “Bahrain announces AH-1Z Buy”. Shephard Media. 15 November 2018. URL: https://www.shephardmedia.com/news/defence-helicopter/bahrain-announces-ah-1z-buy/ (Last Accessed: 24 November 2018).